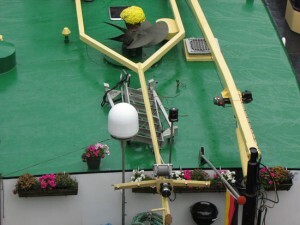 One of the 27 locks on the Neckar River, which flows into the Rhein near Mannheim, is located just below the castle hotel of Hirschhorn. 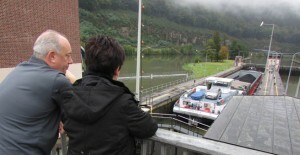 We stayed two nights there and from our rooms could watch barges pass through the locks below. Before we left the area, we took time to watch a barge come and a barge go through the locks. The Neckar River starts off at 2,316 feet above sea level and discharges into the Rhein at a level of 312 feet. All of that difference has to be bridged by locks. To watch these huge barges pass through is to watch a small miracle of technology. The barges slip silently into position and the gates close. And then, a rush of water and not noticeable at first, the barge rises on the tide of new water until it reaches the level of the river on the other side. At this lock, the rise is just over 30 feet. 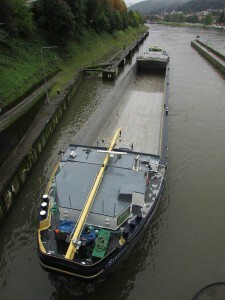 Posted in Germany Tours and tagged barge, custom, designed, hirschhorn, level, locks, neckar, private, rise, river, tours, traffic.